Here’s a shot from the most recent bhikkhu ordinations at Cittaviveka. It depicts the closing piece in the procedure, when, with the new candidates being accepted into the bhikkhu Sangha, that community gathers closely around them to chant blessings. (The same thing happens at the siladhara ordinations). 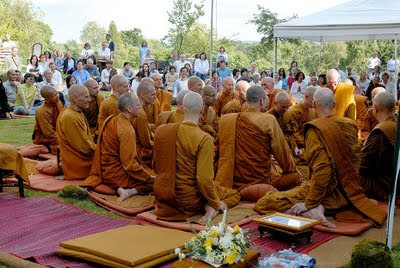 The entire ceremony is a very tight-knit thing – it requires all the bhikkhus to sit within a forearm’s distance from each other, to ensure that everyone is right there and fully present with the procedure. It is very much a gathering into the community – in fact although people call the ceremony ‘ordination,’ the literal meaning of the term upasampadā is ‘the process of gathering into’ or ‘acceptance’ for short. ‘Ordination’ is a term for entering the Christian priesthood, meaning ‘being empowered with religious authority’; upasampadā on the other hand isn’t about empowerment from a divine source, but the illumination of three key frames of reference that support spiritual growth. These are: aspiration, respect and acceptance. There is obviously the uplift of being fully accepted into a communal way of life that has persisted in some form or another for more than two millennia, but upasampadā includes these two other themes, which are reiterated throughout the ceremony in bodily and verbal ways. The personal aspiration, the ‘Going Forth’ is a personal avowal to step out of carelessness and ignorance in order to ‘cross over all suffering and to realize Nibbāna.’ It’s personal, because we ourselves can only know and supervise our minds. Respect for the Buddha’s use of community as a vehicle for liberation is essential to hold the mind under a guidance that you personally honour. Someone might like to count the number of prostrations, and paying of respects in the ceremony – I haven’t, but the point is clear: you really have to want to do this in this teaching and discipline. It’s not going to be imposed on you. So in the course of the ceremony, not just the ordinands but everyone gets a living reminder of a heart-direction for spiritual growth. This is perhaps why lay people always outnumber the Sangha on such occasions; I’d suggest it’s because the meanings of aspiration, reference to the Sangha vehicle and acceptance go beyond monastic relevance. Acceptance is a big thing. When any of us dig down through all the layers of trying to get it right and wondering what others think about us, it’s likely that we’ll stick at a level of the murky but familiar self-judgement: ‘Not good enough.’ Have you ever wondered what it would take to be ‘good enough?’ Would it arise through having more of this quality, or less of that? Or is it a matter of trying harder? However, the likelihood is that all that doubt and struggle is going to hamper one’s performance or cramp one’s heart – so that the end result is more ‘not good enough.’ So it’s just downright pragmatic to begin with self-acceptance: ‘At this time, this sense of being me feels like this.’ There’s clarity and calm in that. Right now we can’t be any other way, but we’ll certainly operate at an optimum and run a lot smoother if clarity and calm replace that nagging ‘not good enough.’ Then with the arising of confidence and goodwill, we bring forth our best in a natural way. We can then isolate any specific blemish and bring clear attention to that before it mushrooms into an overall ‘I am…’ Self-acceptance is a powerful thing; without it, aspiration, the motivating wish (chanda) to bring forth one’s best, turns into the driven need to prove oneself (bhava-tanha) and doesn’t address the points that need looking at. It’s also the case that, as much as we can attempt to accept ourselves, what is truly transformative is being accepted by others. Because to have that happen, we have to trust that we could be more open, more fully seen – and not get dismissed. Also for such a mirroring, we need to have a mirror in the form of a person or a group that is fundamentally benevolent and that we can respect. If we don’t respect others, their standards and opinions don’t count. So acceptance by others isn’t a matter of going along with the most popular trend in town, it’s about being willing to refer in an open way to that in ourselves and others that we respect. Well that’s what the ‘acceptance’ into a community is about. And it starts with recognizing that whatever the aspiration, acceptance comes before complete purity – that those newly-accepted into the community aren’t fully enlightened. Using Sangha as a mirror above any individual teacher, means that the mirror is the example of many wise practitioners; and that keeps things clear in the likely case that most, if not all, of one’s immediate companions aren’t fully enlightened either. There’s a meeting and a mirroring in terms of shared aspiration, know-how and acknowledgement of the pitfalls. Acceptance and aspiration precede purity. This is why any genuine spiritual community is the lopsided thing that it is. In Sangha life, there are the misunderstandings, dissonances and failings as well as the purity, the virtues and the blessings. There are those who have let go of a lot, those who are still carrying confusion, and those who are looking for somewhere safe enough to begin the healing. Like the monk whose mother tried to kill him when he was two, and who beat him relentlessly up until the age of eleven…or the anorexic nun, for whom the greatest challenge, and the point of healing, was being offered alms-food every day by benevolent people. Obviously, these good people had difficulties in being with others, as well as being with themselves. But living in a community based on acceptance provided a crucial a turning point. No judgement, no putting the anagārika in the sin-bin, no talking down. Just that ‘Sleep is delicious, isn’t it?’ It’s like asking you: ‘What do you think?’ That mode of questioning (one of the most frequent teaching approaches of the Buddha) respects our own innate wisdom to come up with the answer. So, yes: delicious at the beginning, and maybe in the middle, but then it segues into carelessness, grogginess, loss of responsibility and the desperate attempt of the self to cover up its lack of authority. And when one reflects further, that profile covers quite a few ‘delicious’ things – most sense appetites take us down that track. (Check it out.) And yet there can be the seeing through this, a gaze that is clear, calm and void of judgement. In this case, Ajahn Chah by seeing through the furtiveness of the anagarika, gave both acceptance and correction. To me, that’s uplifting. What the Sangha vehicle can bring to the fore is just this spiritual friendship. Spiritual friendship, or assoc iation with someone you respect is one of the two factors that the Buddha felt as primary for spiritual development (the other is one’s own wise attention) (Itivuttaka 16, 17; M 43.13). In fact he famously declared it to be ‘the whole of the Holy Life.’ To tease that out a little, let’s go back to the Pali for spiritual friendship – kalyānamitta. ‘Mitta’ is the friendly bit. ‘Kalyāna’ is a term that is used in one of the recollections of the Dhamma as being ‘kalyāna in the outset, kalyāna in the middle and kalyāna at the end’ – here it’s generally translated as ‘good’ or ‘beautiful.’ So we’re talking about a quality of goodness that gladdens the heart; I offer ‘uplifting’ to the pile of renderings. In the sutta on kalyānamitta (S.45.2 ) the Buddha goes on to say that through this one will make much of the Eightfold Path, dependent on non-involvement, dependent on dispassion, dependent on cessation and maturing in complete relinquishment. Now this latter sequence may sound like a trajectory that heads towards divorce rather than deep bonding. However the point is that for liberation, the most useful relationship is one that remains steadily clear and benevolent while lessening one’s attachment to an identity that one has to defend – as being the wonderful, the strong, the obedient etc etc etc. So the kalyānamitta is not a relationship that affirms any self-view, but rather allows one to see, as they do, all the behaviours, good and bad, as dependent on causes and conditions, as not-self. There’s something very freeing about having one’s blind spots come to light, and being received with a calm openness, and maybe a friendly query: ‘Can you see how you got caught in that? Can you let it go?’ Other than offering correction, the attitude of care and respect helps us to address how we make lasting identities – our own and others – out of interpretations of behaviour. An action then becomes a solid person – ‘that’s who I am,’ ‘she’s like that.’ When one thinks of it, it seems so unrealistic, especially when people start forming views of others on the other side of the planet – and yet, that’s how it goes. It’s the process of perception that no rules or standards can eliminate – except that of spiritual friendship. If kalyānamitta is the whole of the holy life, it has to include living within the principles of Dhamma-Vinaya. But in such uplifting friendship, there are no lists of skilful categories, and no mention of planes of absorption; there are also no rules and protocols, other than the encouragement to maintain such association as furthers one in letting go of the habits, dependencies, in fact of that very ‘not good enough’ judgement that dogs the sense of self. Kalyānamitta provides the overview that checks disputes over Dhamma and Vinaya. Not only did the Buddha know that disputes were inevitable in community life, but he also taught what to do when this happens. Sāmagāma sutta (M104) illustrates this in a dialogue between the Buddha and his loyal attendant, Ānanda. And then comes the cure: specifically this entails meeting together to respectfully discuss the source of the dispute, and so arrive at a group consensus. But the sutta makes clear that this has to be backed up by the ongoing practice of acts, speech and thoughts of goodwill, of sharing one’s companions any material gains, of living virtuously and of maintaining focus on right liberation. This is exactly the path and way of kalyānamitta. It’s not that the training rules are trivial, but that disputes about them, or about any community business, can be easily settled if one lives in that fashion. And it illustrates the fact that for deep learning, for the learning of the heart, it’s from fellow humans that we get the whole picture. No mere picture either, but an involvement in a living drama in which the stage is unfolding around you every day and the only script is your mind. When you commit to spiritual friendship, you can’t just dress up as a Buddhist and learn some new part to play; instead there’s a careful unwrapping that one finally allows and feels blessed by. Because in that nakedness of spirit is the joy and the freedom of the Buddha. It is edifying to think that such a community can exist. This humane relationship between individuals seeking liberation in a group setting is quite unique in the world, I think. As you say, its easier said than done, but I appreciate the description of it.